Vkernel the virtualization capacity management company is now a part of Quest – now I really should rewrite my posts on cloud management… (Statement on Vkernel’s Blog) Whether this will really “accelerate growth” for Vkernel remains to be seen however as a firm believer in larger frameworks/ecosystems I applaud this addition to Quest’s already impressive, tho scattered, line-up of management tools. The Virtualization Practice seems to share my opinion – and I agree with them on the fact that the structure of the acquisition (Vkernel will be remain a separate entity) might hinder the integration of Vkernel in a Quest management framework. However Microsoft and Opalis did something similar – and that seems to have turned out alright. I’m not sure yet where I stand in regards to the absolute necessity to, as the Virtualization Practice puts it, “..bubble all of the vSphere metrics up to three simple scores (Health, Efficiency and Risk)..” and I will get back to that some other time. I did a mini-review of vScope Explorer not to long ago and am going to do one on vOperations as well. Maybe I’ll test drive some of the Quest stuff as well in order to form a well grounded opinion on the acquisition and Quest’s position in the cloud management landscape. You need the Windows 7 AIK which is only downloadable as an ISO or IMG. That annoyed me. I used SQL 2008 R2 Express as a database – in hindsight it would have been better to use a full SQL trial and host both SCVMM and SCOM’s databases. Collation, Collation, Collation! Choose SQL_Latin1_General_CP1_CI_AS as your SQL collation otherwise SCOM won’t find your SQL instance and it will not tell you you picked the wrong collation. Product: System Center Operations Manager 2012 Agent — Microsoft ESENT Keys are required to install this application. Please see the release notes for more information. Apparantly this is not a SCOM 2012 specific error but more a general SCOM error on Windows 2008 R2 boxes. Running msiexec from an elevated command prompt solved the problem. This part is pretty straightforward as well. Open the Virtual Machine Manager Console, Fabric pane and choose Add Resource – Vmware vCenter Server. Create a Run As account which has enough the required privileges (local admin on the vCenter server according to Technet). After you’ve added the vCenter server you need to each Resource Cluster (or individual host) as well in much the same way as you added the vCenter server. But since you’re already connected to vCenter you don’t have to enter RC or host names – you can just select them in a browsing dialog. Strangely enough I wasn’t able to retrieve and accept the certificate for any of my hosts using a domain account – which does have root equivalent privileges on the hosts – but either the AD integration is flawed or I made a mistake configuring it. But I used a second Run As account using the default vSphere root account and I was able to retrieve and accept the certificates. After that I was able to view all my hosts and vm’s in SCVMM. Same goes for templates and host networking. SCVMM even sees my dvSwitches and sees them as one entity – but same goes for my vSwitches…which is not really what I would like to see. Portgroups aren’t shown in the networking pane – but I was able to find them in the vm guest properties. I did a quick test to see if I could actually manage stuff – and I could but for now I’m more interested in monitoring vSphere I’ll get down to managing vSphere some other time. 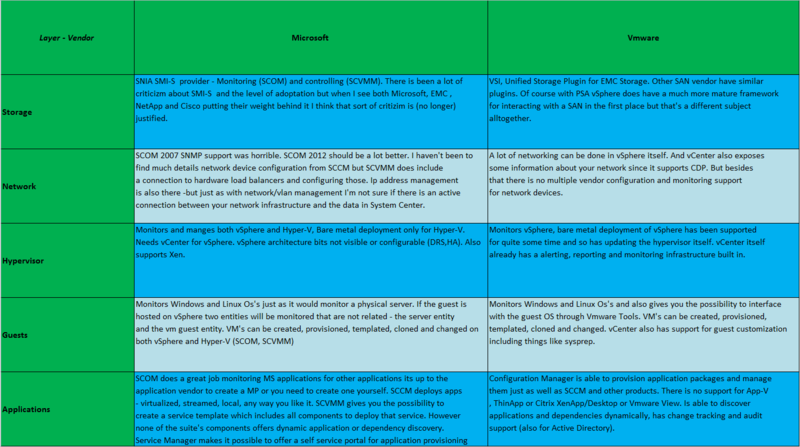 I followed this great post on the SCVMM blog to connect SCVMM to SCOM. Most notable improvement over the previous versions: no need to install the VMM console on the SCOM server. However you still need to install the SCOMsole on the VMM Server. Oh and creating the connection is now a simple wizard in the VMM console :). I had some issues with not being able to search the online SCOM catalog I needed to download the prequisite MP’s by hand. Once I got that sorted out I completed the wizard and the connection was made. And? Has it gotten any better? Yes. Because vSphere and vCenter are represented just as vSphere and vCenter in both SCVMM and SCOM instead of weird vm’s on a mutated Hyper-V server the visibility and navigation is much better. But my SCOMsole immediatly got filled up with alerts telling me my vm’s didn’t have VSG installed – and because everything is discovered through your VMM server (which is does still seem to see as a Hyper-V server) it started complaining about the fact that I had more then 384 vm’s on a host. Alerts are also a lot quicker. Views are a bit poor – especially when you consider that the way my vSphere datacenter hierarchy is displayed in SCVMM is pretty good. The fact that SCOM and SCVMM will allow me to view a diagram of a service as defined in SCVMM look really promising but I haven’t tested that yet. If you put a host into maintenance mode in SCVMM its status is automatically propagated to SCOM. There is still no link between the vm as an instance running on vSphere and the Windows computer object in SCOM – that’s a real shame. There isn’t a lot of Vmware specific stuff there as well. I guess that remains as MS likes to call it a partner opportunity – or something you could develop yourself using vCenter and System Center’s common denominator Powershell. But I believe even that might be less of a challenge then before because of the improved SNMP support in SCOM 2012 (so you can just that in addition to the information exposed by vCenter). Still the biggest improvement seems to be on the managing side rather then on the monitoring side – which makes taking the monitoring shortcomings for granted much more plausible then before. This is my first post in what might become a series 🙂 In these post I want to give a short review of an interesting piece of software or hardware. Today’s victim is VKernel vScope Explorer. I found out about this tool through a post on Eric Sloof’s blog and because I got a promotional email from VKernel (apparently I left my email address there for some reason 😉 ). vScope Explorer is a tool that will visualize and analyze data about your vSphere or Hyper-V environment. So what I expect it to do is to check for configuration Best Practices and analyze both host, vCenter\SCVMM and guest metrics in order to determine possible bottlenecks and inefficiencies. And of course – pretty pictures with lots of green (or red depending on how hard they want to sell the paid complement – vOperations). How does it do whatever it does? The website says they have a instruction video – but I couldn’t find it. So I just fired it up, went through a small text based setup to configure ip,dns,ntp and http proxy settings and was presented with a login screen. (For those interested the appliance runs SUSE Linux Enterprise Server 11 SP1). Seeing this is a web based tool I decided to stop peeking around in the VM itself and opened the web interface. One note on the ip address – since the tool will connect to vCenter you should ensure the vm can connect to vCenter. And there is a user’s guide included in the download. This gives us a hint that the product is indeed looking into performance metrics in great detail. 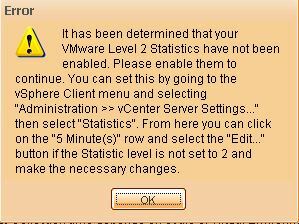 Since this just a test I changed the logging level and it discovered my vCenter server and I finished the setup. I logged in using the default username and password and was then presented with a nice dialog telling me it would take approximately an hour(5 minutes for 10 vm’s) for the data to be collected. I decided not to add any alarms to vCenter or to install the client plugin at this time btw. In all honesty – it didn’t even take an hour until the collection was finished. Once it was finished the tool will showed a status screen that defaulted to the VM performance “vScope”. You can then switch to the Host performance vScope, the Capacity,the VM Efficiency or the Datastore Efficiency vScope. Each Object (a host,a VM or a Datastore grouped together by resource cluster) will have a colour indicating its status (red, yellow or green). On mouse over or when you click the object it will give you some details on why it has a certain status. A red or yellow status can be caused by an inefficient storage allocation, high memory or cpu utilization or on a host level even a projected performance bottleneck or capacity problem with a estimated amount of time until this bottleneck or problem will be reached or occur. I had a quick look at the status of our environment and all the statuses of the objects seemed plausible. However sometimes issues aren’t really issues – we know we have a lot of wasted space on our datastores – that’s because we need a certain amount of IOPS. There is no way to “override” these checks from the vScope interface. And as I said before – in order to properly solve the actual issues something more elaborate such as the vOperations product will be necessary. One big plus – its very portable. You download the OVF, deploy it and you have a very nice overview of the general health of your environment or your customer’s.